notes Gent's white metal (? coin silver), enameled, key wound, open face pocket watch made in the French style, unsigned, most likely made in either Germany or the German speaking regions of Switzerland, circa 1800 with later restorations. 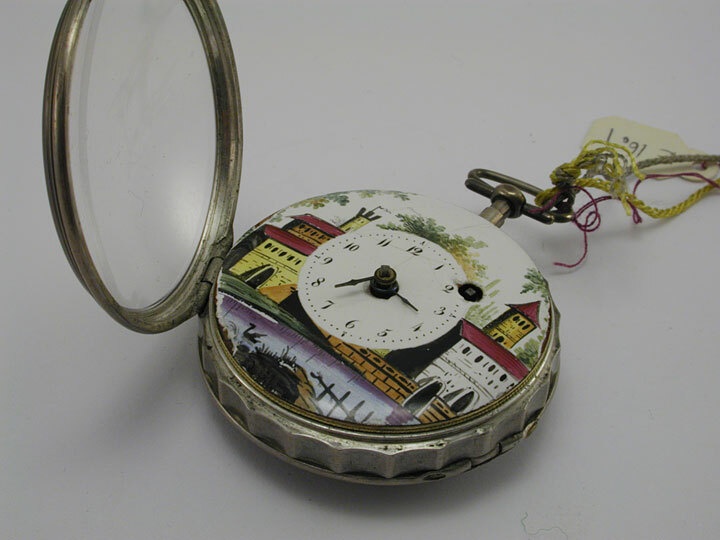 (size not provided) A white metal (possibly coin silver), open face pocket watch case with scalloped edge and telescope-style pendant and oval bow in the style used at the end of the 18th century. The inside of the case is stamped 31705 and marked 'HO', a possible casemaker mark. 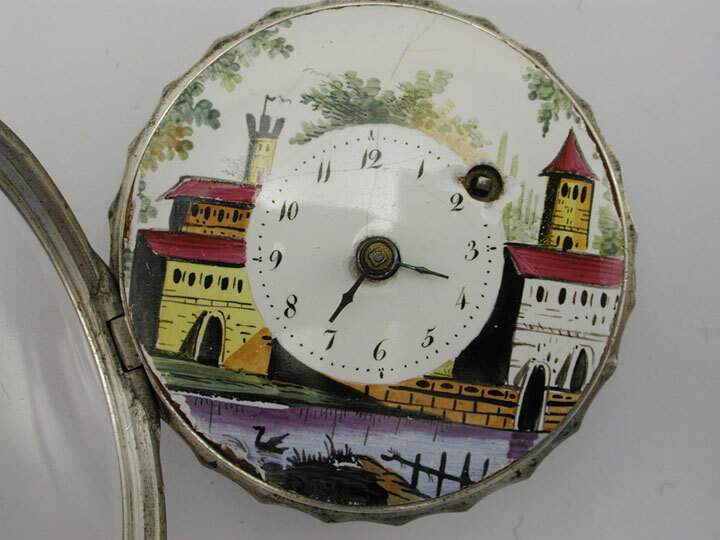 Colorful enamel painted dial surround with central white porcelain dial having Arabic hours, dotted minutes, steel Germanic hands and winding aperture at the two. The surrounding area is painted with a colorful landscape, the scene suggestive of a Romanesque church, monastery or castle, but the brush strokes are not painted with any real precision and it is executed more in the rustic style of paintings seen during the late 19th century. Only the rear movement plate is shown of this key wound movement which may be a verge, key wound, fusee movement. The rear plate is brass and has a round fenestrated balance bridge secured on either side with screws and an adjacent silvered regulator. these simplified type key wound movement were made in both Switzerland (the preponderance were made here) and in Germany. 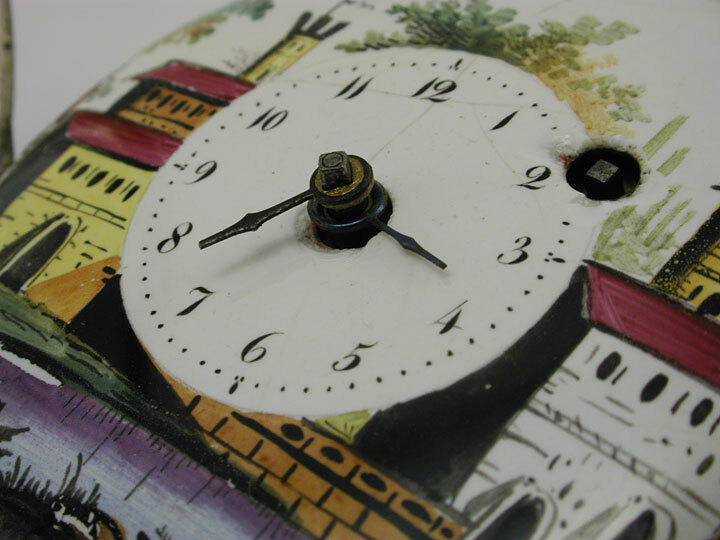 The white dial has a compound porcelain fracture. The dial surround may be a later repaint. The rear plate of the movement looks as it should. 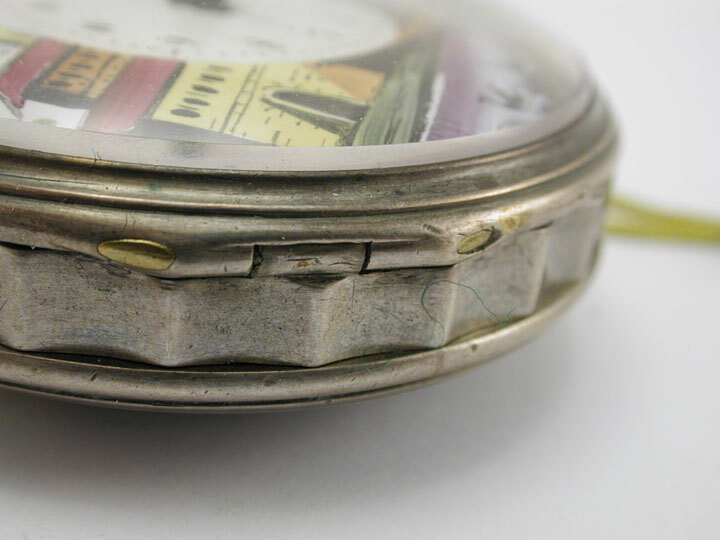 The case shows moderate signs of oxidation. Copyright 1995 through 2018, all rights reserved.